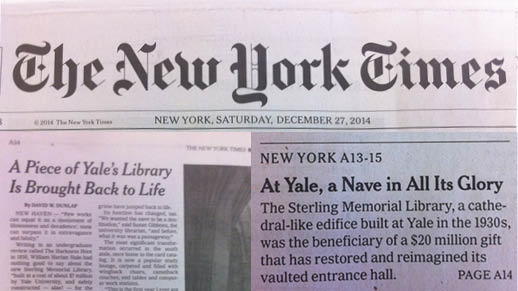 The New York Times front section on Dec. 27, 2014 covered Helpern Architects’ renovation of the Nave of Sterling Memorial Library at Yale University. David Dunlap, one of the Times’ long-standing reporters, wrote about his visit to the Library. The half-page piece includes a video interview with University Librarian Susan Gibbons and pictures by a Times photographer who came with Mr. Dunlap for the afternoon’s tour. Making clear that restoring but also updating the building wasn’t simple, he questioned David Helpern about “the biggest challenge.” He answered that it was the air conditioning. “The walls are pure masonry – stone on stone – with few hollow spaces through which to thread new ductwork and equipment,” he explained. To read the online version of the article, click here . There are several places where readers can tap a photograph and see more views, including the Gibbons video mentioned earlier.